…this year DAY OVERSHOOT DAY arived earlier on the 20th of august…! Earth overshoot day is calculated by comparing the demands made by humans on global resources – our ‘ecological footprint’ – with the planet’s ability to replenish resources and absorb waste. 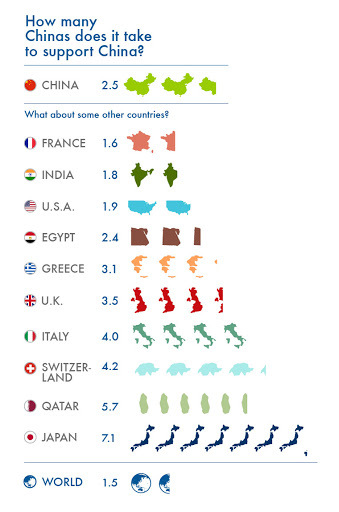 China has the biggest total ecological footprint, because of its large population, but other countries have much higher demands on resources per person. If everyone were to live like U.S. residents we would need four planets to supply demand, the report said. ‘The maths is simple – the UK consumes and produces waste at a rate three and a half times greater than we can sustain, and today humanity has already exhausted what the planet’s ecosystems can provide in a year. 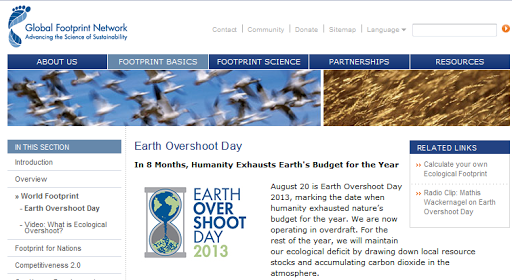 August 20 is Earth Overshoot Day 2013, marking the date when humanity exhausted nature’s budget for the year. We are now operating in overdraft. For the rest of the year, we will maintain our ecological deficit by drawing down local resource stocks and accumulating carbon dioxide in the atmosphere. …well folks simply, at the current World usage of resources and waste produced, we need 1+1/2 more PLANETS…! …do you think hydroponic farms will do it…? I wonder where will synthetic fertilizers come from after CRUDE OIL…? …do you think technology will solve the Planets woes…??? I find it hard to be of good faith…!!! IN EVOLUTION, A SPECIES EXTINGUISHES “NORMALLY” BY LOSS OF SUBSTRATE, OVER-POPULATION, OR OTHER…! ← …in pure logic and literature: the AMERICA’S are not in the BIBLE, making it a ignorant[ignorant’s] Book…!